New analysis reinforces the idea that it’s mostly just one political party that believes there is an intentional effort to remove the religious elements of Christmas from the public sphere: Republicans. The GOP’s identity strongly overlaps with attitudes about the holiday spirit and concerns about political correctness in the United States, according to Morning Consult polling. 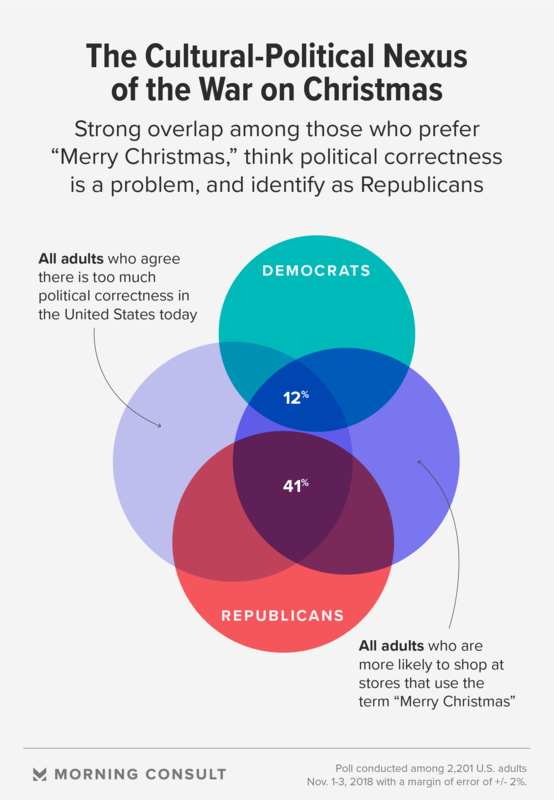 In a Nov. 1-3 survey among 2,201 U.S. adults, respondents who said they believe there is “too much political correctness” and also said that would shop more at stores that say “Merry Christmas” were more than three times as likely to identify as Republican than as Democrat, 41 percent to 12 percent. “The issue of ‘War on Christmas’ seems like asymmetrical warfare, in that only one side seems to be fighting it,” said Dan Cox, an independent pollster and former research director and co-founder of the nonpartisan polling firm PRRI. Every year, the idea that the religious meaning of Christmas is under attack fires up one side of the partisan divide and is largely greeted with apathy by the other, Cox said. These attitudes closely mirror Morning Consult polling conducted last year. President Donald Trump made the issue of political correctness a consistent talking point throughout his presidential campaign, with other Republican candidates also taking up the mantle — including Governor-elect Brian Kemp of Georgia, who went as far as to call himself a “politically incorrect conservative” in 2018 midterm election ads. 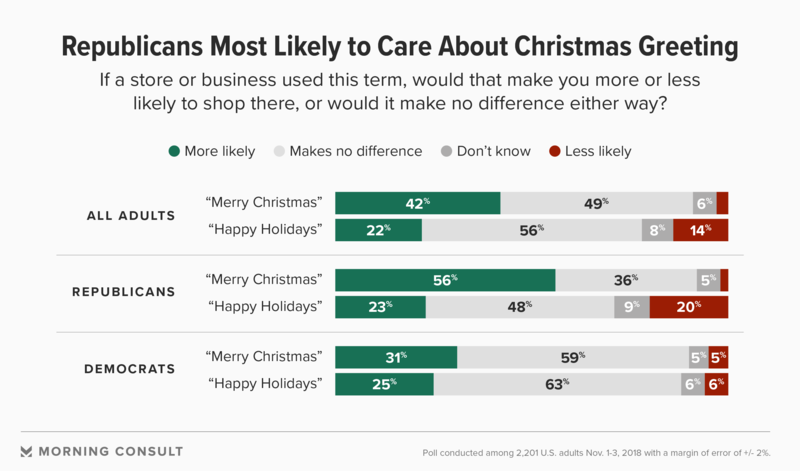 The survey, which has a margin of error of 2 percentage points, shows most adults don’t have strong opinions over the use of “Merry Christmas” or “Happy Holidays” as December greetings, a binary that’s key to the so-called holiday war. Cox said the “War on Christmas” has never really been over the use of the phrase “Merry Christmas,” but more about the message behind it — namely, perceived cultural changes tied to race and religion, as well as Christianity’s slipping dominance in popular culture. Conservative pundits on Fox News, who raised the issue of a “War on Christmas” 15 years ago, aren’t necessarily wrong in picking up on how Christianity is changing in the United States:While nearly all (90 percent) of the public said they celebrate Christmas, according to a 2017 Pew Research Center survey, for the first time fewer than half (46 percent) said they celebrate it in a religious way. That’s a drop from 51 percent who said the same thing in 2013. White Christians, once the dominant religious subset in the country, now make up 43 percent of the population, according to PRRI; 73 percent of Republicans identify as white Christians. The largest “religious” group in the country is now the religiously unaffiliated, making up 24 percent of the public, PRRI found. These changing demographics could be causing Republicans and Christians — white Christians in particular– to feel anxiety and fear about their place in the country, Cox and other experts have said. The “War on Christmas,” like many cultural wars, is less about partisan disagreement over policies, Cox said.